Rrrrowr. 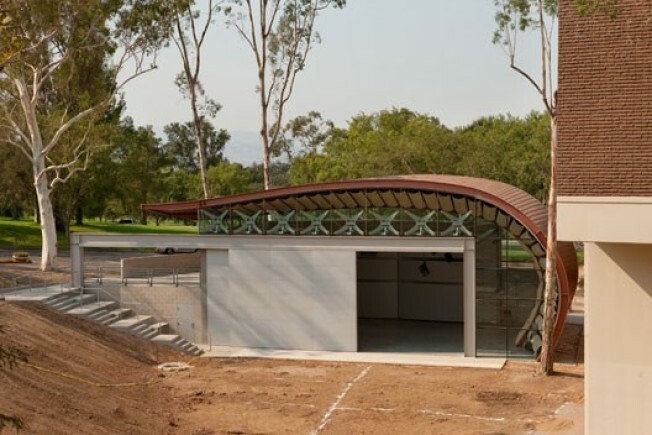 California Institute of the Arts announced the completion today of its new "multi-use music pavilion." Coined The Wild Beast, the project was designed by local architects Hodgetts+Fung. The convertible building on CalArts's Valencia campus goes from an 140-person recital hall to a 1,000-person outdoor amphitheater with the retraction of a rolling wall. Design elements mimic parts of musical instruments. Lead donor Abby Sher got naming rights, and via press release she explains, "The term, 'wild beast' comes from an essay by Morton Feldman about the illusive space in a work of art between surface and subject where meaning lives. It occurred to me that as experimental as CalArts is, and given the flexibility of the building in its functionality and form, if the wild beast could live anywhere, it would be here, so why not give it a chance? And besides, it provides a suitable companion to REDCAT (Roy and Edna Disney CalArts Theater)." CalArts students will start using the building this fall, and it will open to the public with an event in the spring. A courtyard designed by Allen Compton should be finished in winter 2010.